The other day I was looking at my round white potatoes and thought hmmm, they might work well as a crust replacement for a chicken pot pie. So last night I fired up the stove, cut my potatoes in thin slices, fried them until they were golden and used them as the crust for one of my favorite entrees. Inadvertently I made my pot pie vegan, because I was out of cream; and quite honestly, I didn’t miss the cream AT ALL. The pot pie still had great flavor for the gravy. Usually I use flour as a thickener, but this can easily be converted to gluten-free by using corn starch. To cut down on fat, I saute my onions, celery and garlic in water instead of oil or butter. The great thing about a chicken pot pie is that you can use what ever you have on-hand in the refrigerator or freezer. Peas, pearl onions, mushrooms, carrots, green beans, corn — whatever little bit you need to use up — just throw in your stew. Heat oven to 350 degrees. Grease 9×13 baking dish. Slice potatoes into thin slices and lightly fry in a skillet until golden. Line the bottom of casserole dish with a layer of potatoes. Set the rest aside. Fry chicken strips until golden. Set aside. Saute onion, celery, garlic and carrots in 1/4 cup of water until soft. Add water add needed during sauteing. Stir occasionally. Add wine and vegetable broth and season with salt and pepper. Mix corn starch in a little bit of cold water, until it’s disolved. Add to mixture on the stove and bring to boil for 2 minutes. Stir to prevent lumps from forming. Bring to a boil. Add thyme, peas, mushrooms. Reduce heat. Simmer, stirring frequently, 5-9 minutes. Add chicken and remove from heat. Pour mixture in baking dish and layer the top with remaining potatoes. Bake until bubbly; approximately 20-25 minutes. I’m a sucker for good comfort food. So when Southern Living chose to feature chicken pot pie on the cover of its February 2011 issue, it wasn’t a hard sell. What I didn’t expect to find was one of the easiest stove top recipes that is easily one of the best pot pie variations — hands down. Of course I’ve substituted Morningstar Farms’ Chick’n Strips for the real thing. And I love the super duper secret ingredients: cream cheese and Italian dressing mix. 1. Bake biscuits according to package directions. 2. Brown chicken strips in skillet until lightly golden. 3. Meanwhile, saute onion in in hot oil in a large skillet over medium-high heat 5 minutes or until golden. Add mushrooms, and saute 5 minutes or until tender. Stir in chicken and next 5 ingredients; cook, stirring freguently, 5 minuts or until cheese is melted and mixture is thoroughly heated. Stir in peas, and cook 2 minutes. 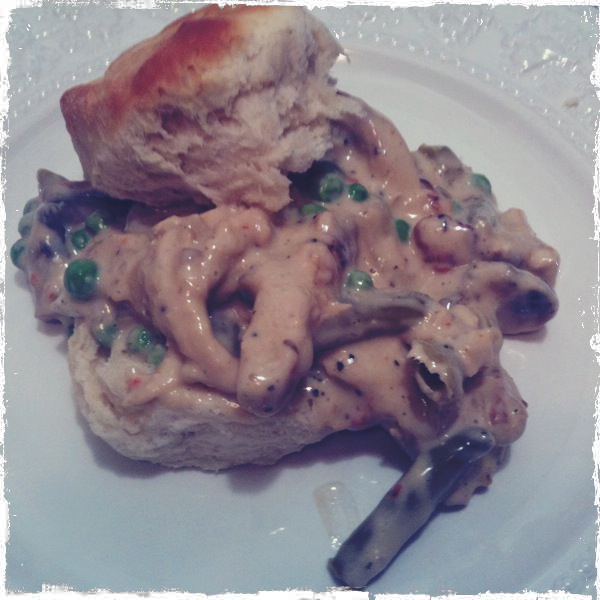 Spool chicken mixture over hot split biscuits. Here was my dilemma: curry or Pad Thai. 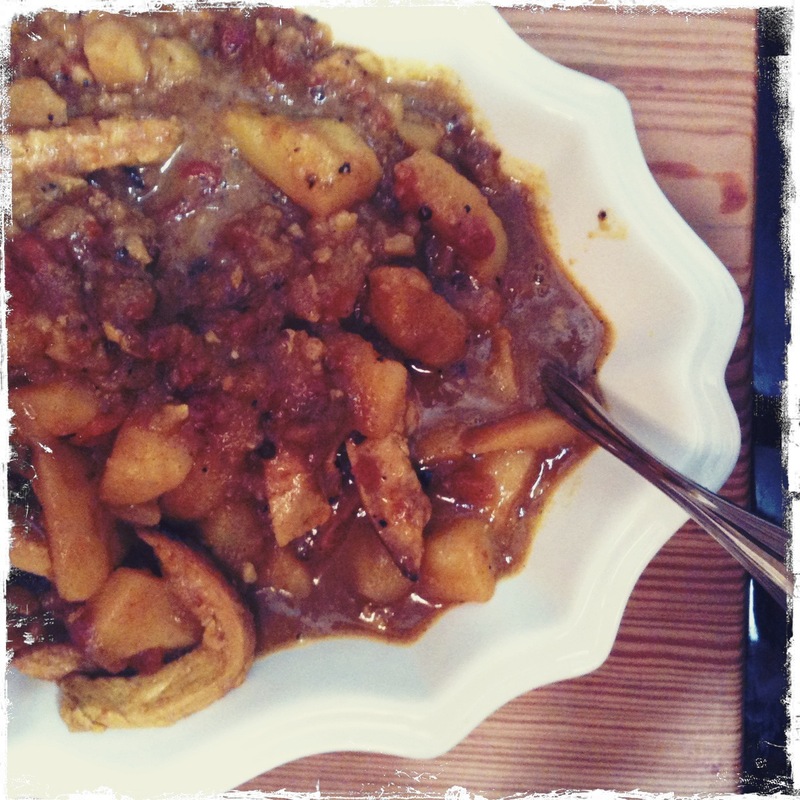 Well I had some potatoes in my arsenal begging to be used so the curry won the battle. However the overcast day may have tipped the scales because cloudy days make me crave carbs. Therefore I ended up with the most wonderful curry. I originally found this recipe on Food Network when I was searching for a vegan dish for some friends. Just use olive oil instead of better and voila! Vegan. Sauté the onions with the potatoes until they caramelize. If you don’t like salty foods, cut the salt to 1 teaspoon, and add as desired. My Indian friends suggest that instead of grinding the Coriander seeds, just drop them directly into the hot oil and let them pop open. This did add a nice texture to the dish. For protein, add MorningStar Farms Meal Starters Chik’n Strips. Directions Cut the potatoes into 1/2-inch dice. To remove the excess starch, place the potatoes in a bowl and rinse with cold running water until the water runs clear. Drain well. Heat 1/4 cup clarified butter in a medium saucepan over medium-high heat. Saute the onions until they are brown. At the same time, heat the remaining clarified butter in a large skillet over medium heat. Fry the potatoes until they are golden and add sautéed onions. Add the garlic and ginger, and cook just long enough to release their aromas, about 2 to 3 minutes. Remove from the heat and add the cumin, turmeric, coriander, and pepper flakes. Return the pan to medium heat. Stir in the tomatoes, chicken stock or water, and salt. Simmer, uncovered, until the potatoes are soft, about 15 minutes. Add the remaining ingredients and cook until the peas are heated through. Adjust the seasonings and serve immediately.